Trent has always known he wanted to be an architect. Initially hired at BRS as an after school errand runner at 17 years old, Trent has spent over half his life working for BRS Architects. 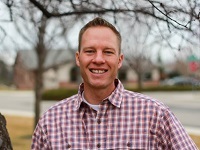 After graduating with a Bachelor of Architecture from the University of Idaho in 1994, Trent returned to BRS, eventually becoming a partner and principle architect in 2005. Trent is very experienced in working with Project Developers, City Planning and Zoning staff for all types of commercial development projects. Outside of architecture, Trent’s passion is to spend time outdoors with his wife, daughter and 2 Labrador Retrievers. Whether hiking, mountain biking, camping or fishing, Trent’s love for all things outdoors has led him to obtain his LEED® accreditation and now serves as one of BRS’ in-house sustainability consultants for “green” projects.